Breaking apart custom water cooled build. 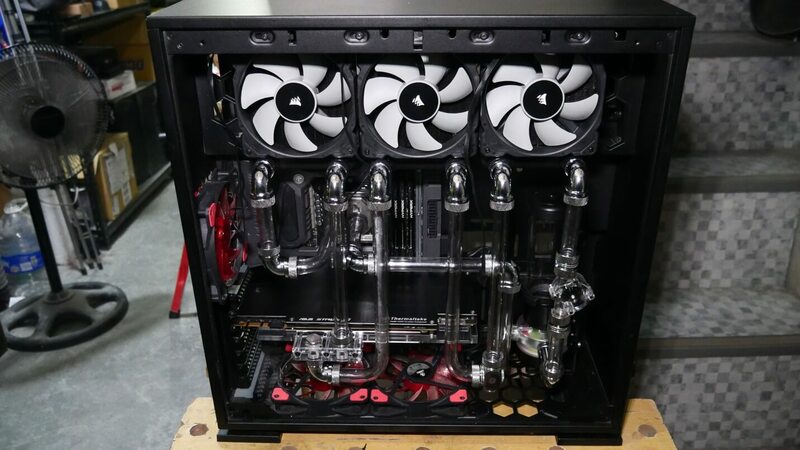 Custom water-cooled systems have become really popular in recent years because of the optimal cooling solution that it offers, as well as the attraction that it adds to the overall appearance of a build. Maintenance of a water-cooled PC build is quite a challenge. And while dismantling a work of art that you spent blood and sweat on is not exactly enthusing, breaking things down into pieces before ultimately ending up with a beauty is an integral part of PC Modding. Ideally, you’d want to do a clean-up every 6 months to keep the liquid pristine and see to it that the thermal conductor on your CPU Block hasn’t completely dried up. If it’s impractical to do this on the other hand, keeping the system running for up to a year is A-Okay though the coolant might not appear as vibrant as it was on your first fill. In addition, observing the unit’s temperature can also help you decide on when to do maintenance. An increase by 10 degrees Celsius or more is basically your cue. WHEN TO BREAK IT AND MAKE IT? 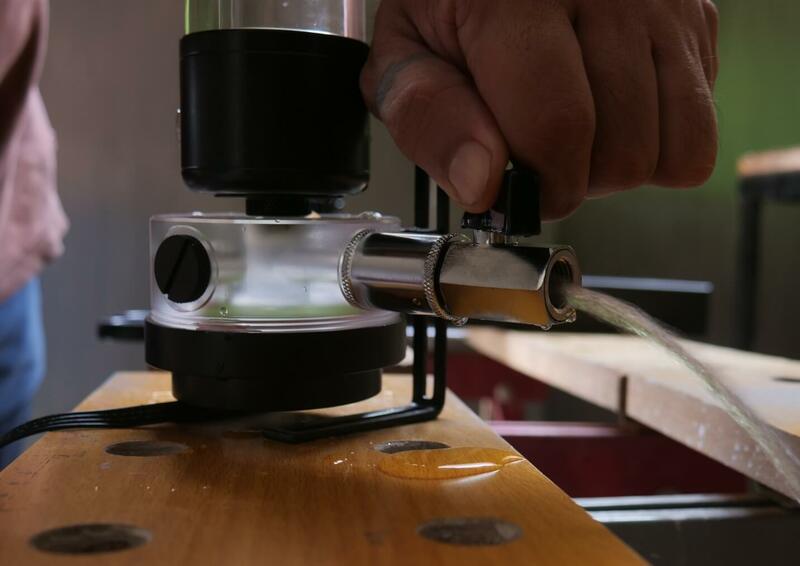 Due to the fact that it takes a lot of time to drain, swap out parts and test for leaks, even expert builders find installing new hardware in a water-cooled build a test of patience. You might want to pick a time of the week when you can give it your full attention like days heading towards the weekend. Fitting angles and loop courses will most likely change, so you need to plan ahead. It’s not a must but using a software solution like Sketch Up is definitely a big help with getting everything inside your head organized into a visual of a possible outcome. But then again, a pen and paper never goes out of fashion. Draining a water-cooled build can be tricky if not carefully planned. Strategically placing a drain port on the lowest section of the loop is a must-do. It ensures that we can easily empty the loop as needed in the future. Prepare a bundle of tissue paper before draining water from the loop; it will come in handy when you need to wipe accidental spills and it can be used to catch coolant drips when testing. You can place them around the fittings, connectors, in areas between parts like the tubing and CPU water block, as well as on top of the Graphics card and so on as you see fit. 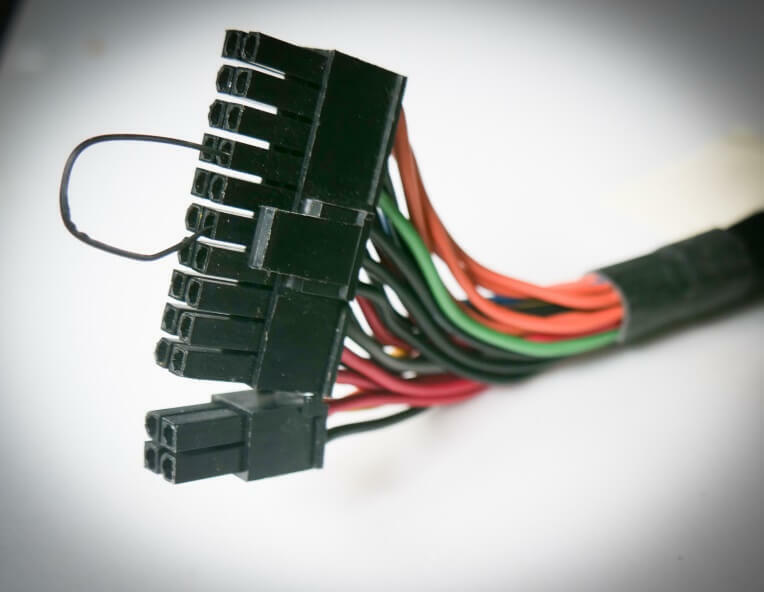 Start things off by making sure that you’ve removed all the cables that supply power to your machine. This will give you freedom to move things in and out, so you can conveniently drain all the liquid out of the loop. No cables no problem as shown on the picture below. One thing that is constant when replacing any of the components of your water-cooled build is that you have to drain the coolant out before you can swap around parts. This is critical to avoid getting water where it’s not welcome. Going from soft to rigid tubing requires changing all compression fittings, since the ones you used for the earlier will definitely not work with the latter and vice versa. 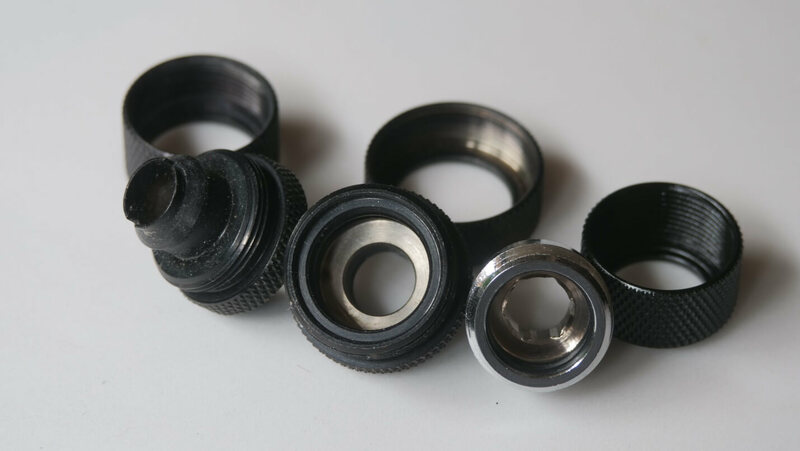 Also, keep the different sizes of rigid tubes and fittings in mind. Say you’re using a 16mm rigid tube. You should pick out compression fittings matching its size. 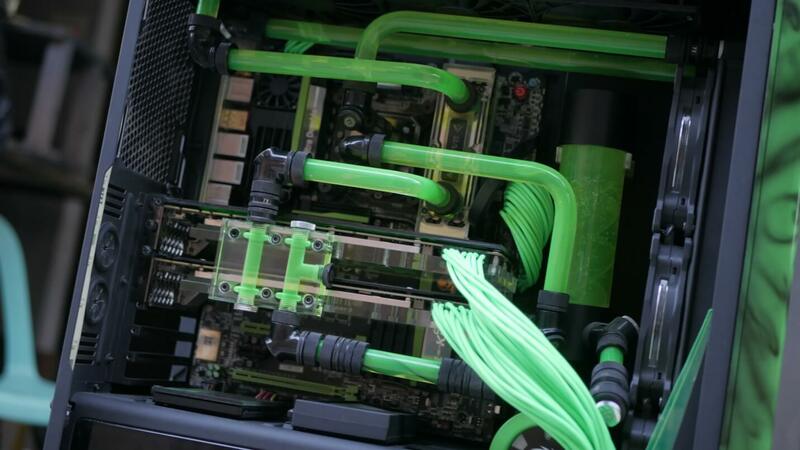 Same goes if you are to switch from a specific size of rigid tubing to another (e.g. 12mm to 14mm). 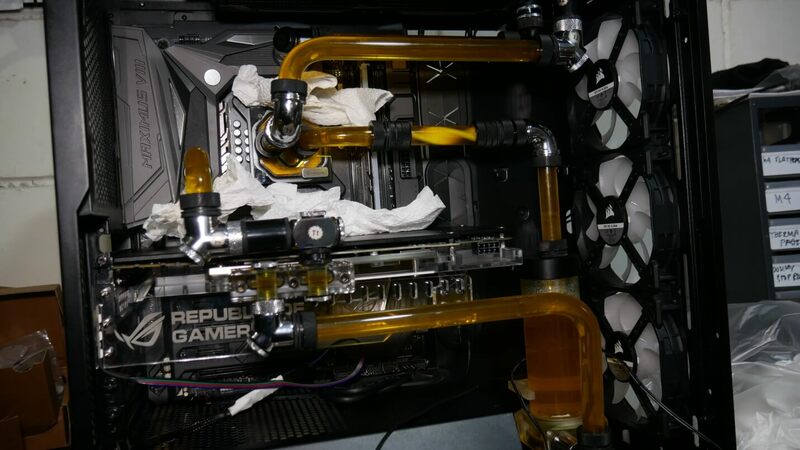 After successfully refilling the reservoir with enough coolant, do not connect the power supply to the motherboard and graphics card just yet. 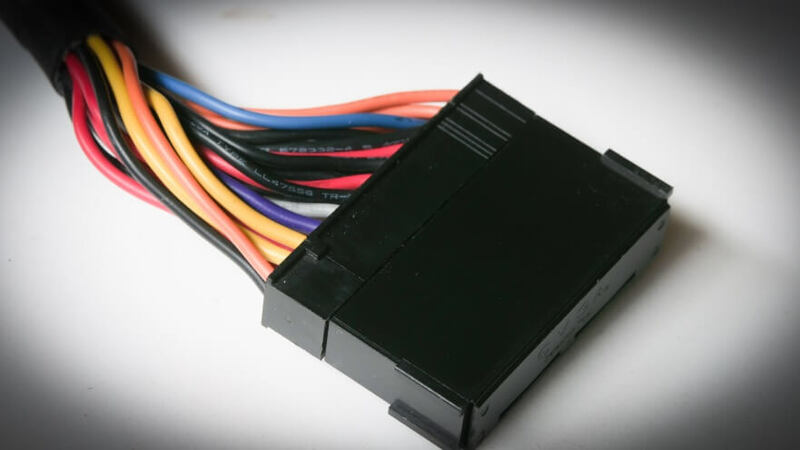 Plug the pump alone to the 4-pin Molex connector of the power supply, and then use a 24-pin adapter to perform a jump start allowing the pump to distribute the coolant around the water cooling system. 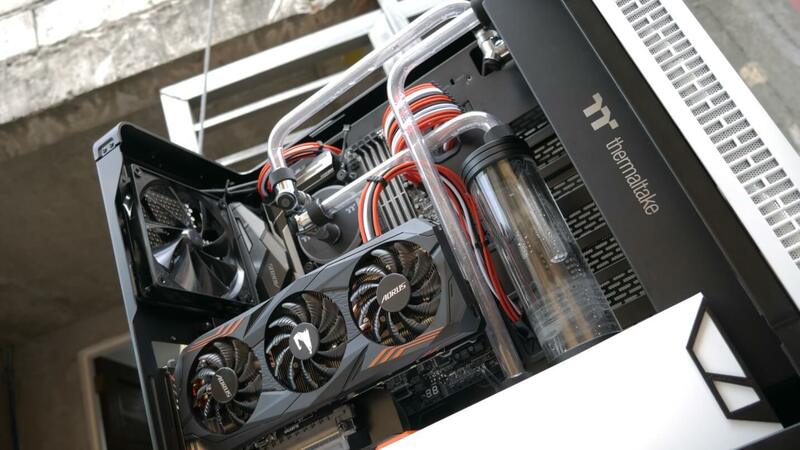 The first time you switch the power supply on, you’ll notice that the liquid starts to circulate between the parts of the water cooling system leaving the reservoir empty. Once this happens, turn the power supply off to prevent the pump from getting damaged. You then have to fill the reservoir again to its maximum capacity, then repeat the process of turning it on and off until there’s enough water circulating in between parts. PSU Jumper connected to the 24 pin cable of the power supply. (Make sure that you power supply is not plugged in a wall socket or extension cord) If you don’t have the jumper thingy you can use a piece of wire, hair clip or even a stripped twist tie; insert one end to the slot of the green wire and the other end in the slot where there is a black wire, The black and green wire should be on the same row of pins. It is hard to miss the green wire as there is only one of it. In the case that all wires on you 24 pin are black then you can take a good look at the image below to determine where the green wire is, normally with the clip of the 24 pin faced up start counting at the top row it is the 4th slot from the left then the other end of your clip could go on the 6th. Air bubbles will be present in the tubes, water blocks, and reservoir the first time you fill and run the system. Stay calm as they will eventually disappear if you let the pump run for a few hours or sometimes a whole day. This process is often called “bleeding”. All of the above may seem daunting but getting well informed is the key to a positive experience. At the end of the day you just have to pick up all the tools and start doing it “experience is key” to every water cooling endeavor in the world of custom built computers.